on the first Thursday of every month at 13.00 hrs and at other times as advertised. at 13.00 GMT winter, 1330 BST summer. Timetables for Islamic prayers are provided in the Multi-Faith Prayer Rooms with correct times for Manchester. The Qibla (direction for Islamic prayers) is set correctly under the authority of the Airport’s Islamic Chaplain. If you have reason to doubt its accuracy, do not move or deface the sign, but contact a member of the Chaplaincy Team. 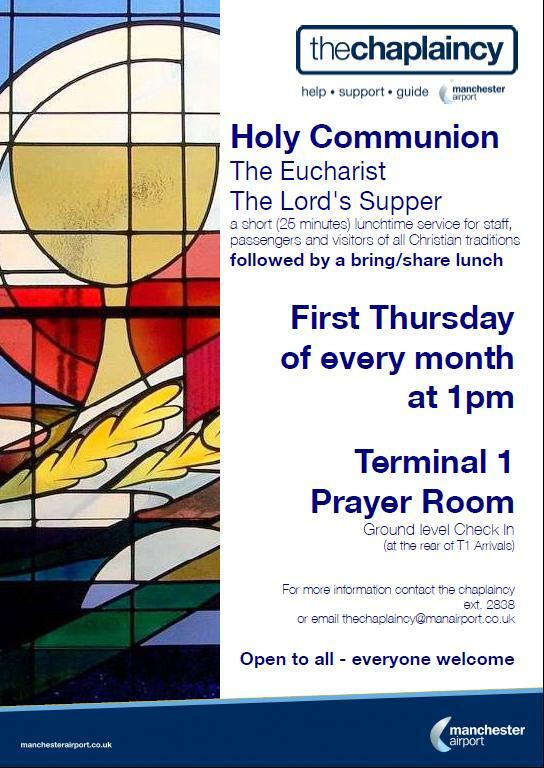 If you would like to speak to a member of the chaplaincy team please contact us on 0161 489 2838.